The Laminated Jumbo Organizing Calendar is a fantastic calendar that you could use to stay organized. There are so many things that you need to keep track of if your dog has cancer; treatments, medications, veterinarian or vet oncology appointments and so much more. ARE YOU READY TO TAKE ORGANIZING TO THE NEXT LEVEL? Long gone are the days of thin laminates and special plastics that rip and are hard to erase! You DESERVE a more efficient and higher quality wall calendar. No one wants to waste time organizing, so why take that risk? EXPERIENCE THE OfficeThink PET FILM DIFFERENCE! Our new laminates feature unique OfficeThink PET Film that right now you can't find anywhere else on the market. You know why? We spent months developing it and started selling it on 6/1/2017. PET Film has been tested and proven to be better than cheap laminate, thermoplastic and special plastics in the following categories: Wet and Dry Erase Marker Erasability Melting point and hot/cold temperature resistant Tensile strength Tear strength Recyclable BONUS MARKERS, ERASER & TACKS INCLUDED! What good is a calendar without the necessary instruments!? Each calendar comes with 8 large tacks to make hanging the calendar as easy as 1-2-3. We also threw in five dry erase markers and an eraser so you don't need to buy anything else! NEVER FOLDED AND EASY TO ERASE Since we NEVER fold our calendars, each and every calendar arrives to your door looking crisp and ready to be put to good use! EASY BREEZY ERASING: Starting 6/1/17 We developed a unique OfficeThink PET Film that years later will easily erase dry and wet erase markers. So, go ahead and use as many colors and thick lines as you want on this calendar because erasing is a breeze. 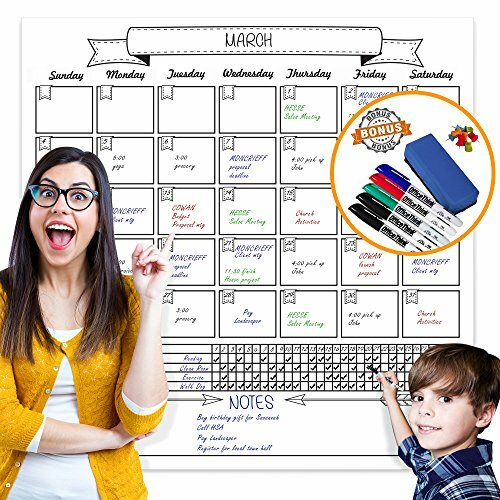 BONUS ITEMS INCLUDED starting 3/1/17: With every calendar you will receive 4 dry erase markers, a high quality eraser and 8 jumbo tacks so you can attach the calendar to any wall of your choosing! This is the ultimate package for any organizing pro. SHIPS ROLLED, NEVER FOLDED: Unlike other companies, we never fold our calendars. To ensure you never receive creased lines or wrinkles on your calendar, each of our calendars are gently rolled and prepped for shipping so it gets to your front door without a single blemish. TAKE ORGANIZATION TO THE NEXT LEVEL: This calendar is our 2nd largest (3 ft by 2 ft) with large date squares. We even added a spacious "special notes" section for all your planning needs. Whether you use it for your family, business, or classroom, you'll find yourself planning like you never have before. LIFETIME WARRANTY and 100% MONEY BACK GUARANTEE: Warranty is provided by OfficeThink with easy registration after purchase, for 100% Money Back guarantee and Quality guarantee you must purchase from Avendale Mall. It will say "Sold by Avendale Mall and Fulfilled by Amazon". Purchases from any other unauthorized seller under this listing will not qualify. Thank you for your understanding.